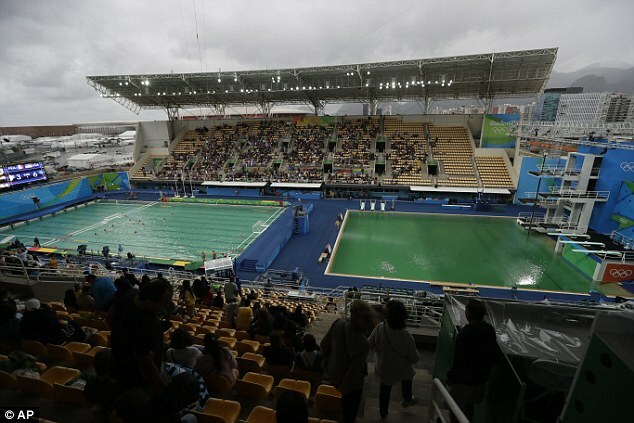 The diving pool appeared a normal blue colour on the first two days of events, but turned green during the women's 10metre platform final. On Springboard, Chinese Shi Tingmao who has one gold medal is placed first in the 3m semis on Saturday to put her in prime position for Sunday's final. At the age of 14, Comăneci was the most talked star of the 1976 Summer Olympics in Montreal. During her routine on the uneven bars, she was awarded a perfect ten. It was the first time in modern Olympic gymnastics history that the score had ever been awarded. It is reported that Omega SA, the traditional Olympics scoreboard could not display it properly as the manufacturer was told that 4 digits was not necessary – hence Nadia's perfect marks were displayed as 1.00 instead. The crowd was at first confused, but soon understood and gave her a rousing ovation. Over the course of the Olympics, Comăneci would earn six additional tens, en route to capturing the all-around, beam, and bars titles, and a bronze medal on the floor exercise. Now this Russian is in news ~ though for undesired result. She is a multiple gold medallist at several European Championships, winning events both as a part of a team and as an individual. But despite her haul, Russian diver Nadezhda Bazhina is likely to be remembered for one thing - for scoring zero with a back flop into the pool at the Rio Olympics. The athlete produced the horrendous dive during the 3m springboard preliminary round with an eye-watering performance, reports MailOnline. It was supposed to be a three-and-a-half somersault, but what occurred was something completely different. The accomplished diver seemingly losing her footing as she sprang from the board but completed several flips as she fell, looking as though she has regained her composure halfway through the routine. However it wasn't to be for the Russian, who smacked back-first into the water, much to the amusement of commentators and viewers. The miscalculation left the athlete with a score of zero, ending her hopes of making the semi-final of the event despite four good dives beforehand. A BBC commentator said: 'So what happened is Bazhina's landed with basically one foot on the board, the other one has slipped right off the side, and that's killed her take-off. No height and that was calamitous.' She completed several flips as she fell, looking as though she has regained her composure. Bazhina isn't the first diver to make a real splash at the Olympic Games, after a similar disaster occurred at London 2012. Germany's Stephan Feck attempted a somersault, but lost the grip on one leg which saw him spin out of control and land flat on the water flat on his back with a huge thud. He climbed out of the pool apparently unhurt after huge gasps from the crowd during the men's three-metre springboard, but received zeroes from all the judges. Last year, Australian Maddison Keeney's disastrous dive at the World Titles earned her a ZERO from the judges (but a perfect 10 points on the internet!). At World Aquatics Championships in Russia, the young gun's nerves appeared to have got the better of her and following the disastrous dive she slipped from fourth place to twelfth. In gymnastics, the maximum possible score was a perfect 10 until the rules were changed in 2006 by the International Gymnastics Federation. Besides, Romanian Nadia Comăneci Mary Lou Retton in 1984 and Daniela Silivaș in 1988 too have got the perfect 10. Currently, there are different top scores for various events based upon difficulty ratings and no consistent perfect score. Perhaps the Russian should consider herself lucky not tobe in the land of arm-chair critics who immediately would have pounced on her performance, without themselves having accomplished anything worthy !